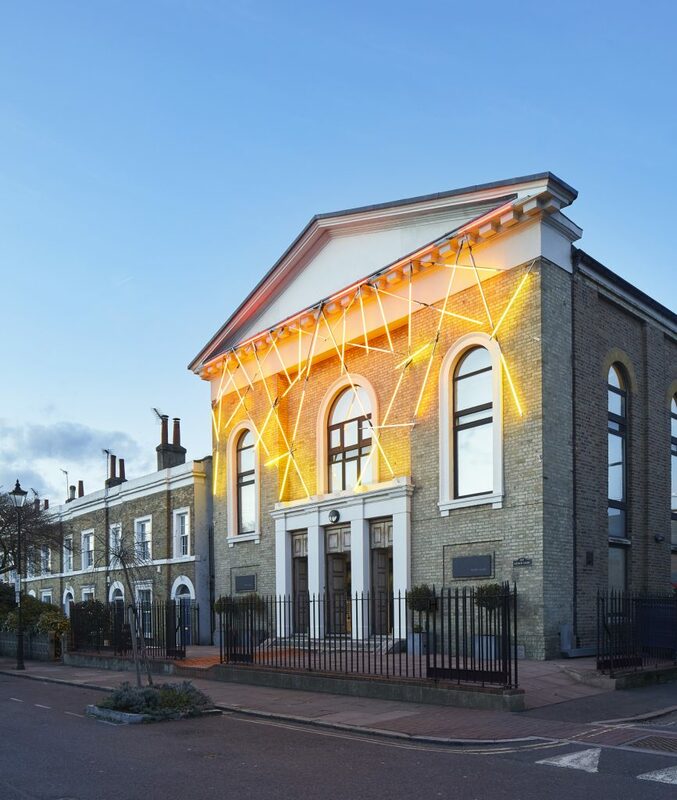 This year the architects and town-planners Rolfe Judd celebrate the 50th anniversary of the practice, and have marked the event by illuminating the façade of Old Church Court, their premises in Claylands Road. 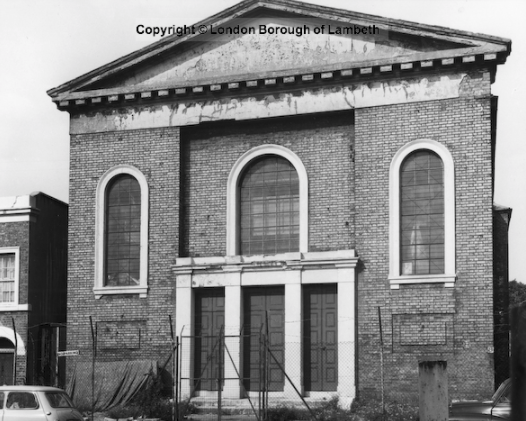 Who was the architect of this former Congregational chapel isn’t clear, but according to the edited extract of the Rolfe Judd article below, it could be D. R. Roper, architect of St Mark’s, Kennington, opposite The Oval tube station. The ‘Claylands’ in the former chapel’s address refers to the marshy ground thereabouts to the north of which flowed the River Effra, now culverted into a sewer. In 1801, the Dean and Chapter of Christ Church, Canterbury, sold off one part of Claylands to John Daniels of The Lawn (now Vauxhall Park) and the other part to wealthy brick merchant John Fentiman, who at his own expense drained the land and built a ‘handsome mansion’ on what is now Claylands Road. The foundation stone for Claylands Road Chapel was laid by the Rev Dr John Styles in 1836. It is not clear when Claylands Road itself was laid out but by 1836 Fentiman had granted a lease on a plot to the north side of the road to his son John Junior for the erection of a Congregational chapel. The foundation stone was laid by Reverend Dr John Styles, formerly of the nearby Holland Chapel in Brixton Road about 12 years earlier. 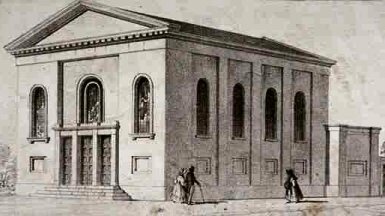 The Claylands Road Congregational Chapel opened its doors on 29 June 1836 and Dr Styles continued as its minister until 1844. 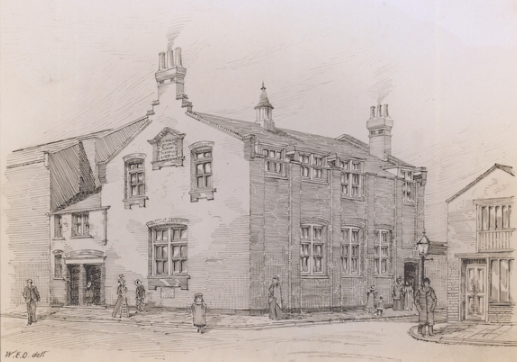 Among the congregation in later days was the family of the Arthur Rackham, the children’s’ book illustrator, who lived in nearby Albert Square. The chapel was built of plain stock brick with a classical pedimented front. There are three entrance doors divided by stucco pilasters with cornice and blocking course above. The windows are round-arched over recessed rectangular panels. It is said that at one time a gallery at one end of the interior and the building ‘had some William Morris decoration’. In 1899 a Claylands Sunday was built to the rear of the Chapel by Messrs. Rice and Son, with W. E. Davis as architect. It is not clear when the properties ceased being used as a chapel and Sunday school. The building fell into disuse by the mid 20th century and was eventually used to store construction material. The long-disused Claylands Road Chapel was in a sorry state by the 1960s, reduced to storing building materials. The buildings continued to fall into disrepair until bought by the founders of Rolfe Judd in the late 1960s, who up until then had rented temporary offices nearby. Over time, the buildings were restored, sensitively we hope, to incorporate three new floors of office space punctuated by a central atrium. This building was then linked to the school to the rear and two further office floors were created. Externally, however, the chapel and school buildings remain essentially unchanged except for the replacement of windows and the removal of the old chapel signage. The railings were also altered but retain their original character. We hope Dr Styles would approve.